The relationship between the church and state is the institutional form of relationship between the religious and political factions of a nation or state. In Christendom, Jesus recognized a division between the two realms of influence when he commanded his followers to render undo Caesar that which is Caesar's, and unto God that which is God's. Throughout the various governments in history, this relationship has taken a variety of forms. The concept of separation of church and state is one that has been adopted, to varying degrees, in several countries. The degree of separation varies from full separation, mandated by a constitution, as is the case in India and Singapore, to the other extreme, which establishes an official state religion and the prohibition of any other religions. A government in which the church rules the state is known as a theocracy, while one in which the state rules the church is known as Erastianism. The focus of sites listed within this category, or any of its subcategories, will be on the relationships between faith groups and governmental bodies, or those which combine religion and politics in any manner. Faith-based political lobbying groups are an example of topics that would be appropriate here, as are secular or anti-religious groups lobbying for a lessening of influence of faith in the political sphere. The First Amendment clauses to the United States Constitution provided that "Congress shall make no law respecting an establishment of religion, or prohibiting the free exercise thereof." The part of the sentence before the comma is known as the "establishment clause," while the section after the comma is the "free exercise clause." Regardless of subsequent applications, the obvious goal of the religion clauses was to protect against congressional actions. There is no indication, in the language of the Amendment, that the terms were intended to apply to other branches of government, or to the states. The free exercise clause protected the rights of people to worship whatever god or gods that they pleased, but there is nothing in the language to indicate that this portion of the First Amendment was intended to protect atheists or other non-believers, although they were given limited protection under the First Amendment's free speech, free press, and assembly and petition clauses. The clear purpose of the establishment clause was to complement the free exercise clause and, as such, was subservient to it. The establishment clause protected the free exercise of religion by barring Congress from establishing a national religion, or otherwise favoring one religion over another. It did not bar the states from doing so; in fact, it prevented Congress from interfering with established churches in those states which had them. This is borne out by the fact that, following the adoption of the Bill of Rights, no action was taken against any of the states that had established churches. State churches were broken up much later, and that was as a result of political pressures within the individual states rather than through an act of the U.S. Congress. There is nothing in the language of the First Amendment to suggest a "wall of separation between church and state." That language was lifted from a letter written years later by Benjamin Franklin, who was not even in the country when the Bill of Rights was drafted. During the ratification debates, Anti-Federalists warned that the Administrative branch might enter into a treaty with a foreign state by which a particular religion might be established. Only thirteen years earlier, the terms of King Charles II's 1660 Treaty of Dover, with King Louis XIV of France, had been made public. Under the terms of this treaty, King Charles II was obliged to convert to Catholicism, and to begin the process of establishing the Catholic Church as the official church in England. Even more recently, the Confederation Congress had entered into a treaty with the Netherlands which potentially restricted religious freedom for Americans in Holland, and for the Dutch in America. Obviously then, the original members of the United States government understood that the religion clauses of the First Amendment were intended to limit the powers of Congress only. There is also nothing in the language that would seem to prohibit Congress from advancing the cause of religion, so long as they were not favoring one religion over another. In fact, the chief concerns of the authors of the amendment were over the advancement of one Christian sect over another. The First Congress, which enacted the religion clauses of the amendment, set aside land "for the purposes of religion," and promoted religion, morality, and knowledge in public education. Bible reading was supported in the public schools, a practice that did not become an issue until much later. An additional point that should be made is that during the debate in the First Congress, James Madison proposed an additional amendment that would be applicable to the states. It read, "No state shall infringe the equal rights of conscience, nor the freedom of speech or of the press, nor of the right of trial by jury in criminal cases." 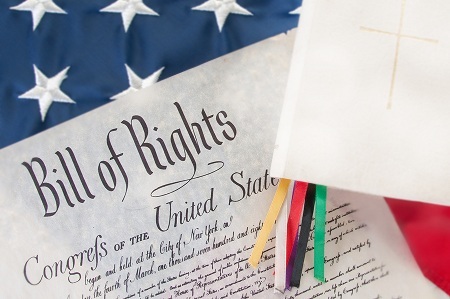 If it was necessary to prohibit the federal government from infringing on these essential rights, Madison argued, it was equally necessary that they should be secured against the state governments. Significantly, Madison did not propose that the establishment clause be made applicable to the states. His proposal was adopted by the House, but rejected by the Senate, leaving the entire Bill of Rights solely as limitations against the federal government, where they remained until a later Supreme Court found language in the document that was neither written or intended by its authors. The scope of the religion clauses are not defined by what Congress views as religious or worthwhile, but what the believer views as his duty toward whichever god or gods he chooses to worship. As written, and understood in the early years of the nation, the free exercise clause guarantees the widest possible scope for religious activity, and the establishment clause ensures that religious activity was not to be mandated or prohibited by Congress. The United States Navy Chaplain Corps is made up of clergy who are commissioned naval officers, endorsed by ecclesiastical bodies of several religions and faiths, who provided assistance for all Navy, Marine Corps, Merchant Marine and Coast Guard personnel and their families. Although the military of other countries have similar positions, in the United States chaplains have non-combatant status and are prohibited from carrying weapons. Founded in 1947, AU has worked to diminish the role of religion in government and the school system, with conservative Christianity and what the group views as the political right being its primary targets. Its primary issues and an overview of its current projects are highlighted, with suggestions for those who would like to become involved in its work. Other resources include its research into the religious right, church-state history from its perspective, and various publications. The CSA is a non-profit, public policy research and advocacy organization created to advance church-state separation and the neutrality of government in matters of religion in Canada, its position being that only a secular government can defend the rights of all Canadians equally. Its organizational structure, membership policies, policy positions, statements, and special projects are highlighted, along with news report and video on related topics and events. The CC is a political organization made up of pro-family American Christians who seek to ensure that the United States government serves to strengthen and preserve family values, rather than threaten them. Its site represents a conservative, pro-family worldview before local governments, school boards, and state and federal governments, and works to train and to encourage American Christians and Christian churches to speak out and become involved in government. Action items are highlighted. An initiative of the Network for Church Monitoring, the site discusses a variety of issues, including the challenges the world faces, such as overpopulation, environmental sustainability and social stability, but from a worldview that is generally in opposition to Christianity and, in particular, the Roman Catholic Church. News and opinion articles on various Christian and political leaders, church scandals, and other issues are put forth. Authors and their books are introduced. Presented by Liberty Point Institute, the site discusses the battle for religious liberties that it views as occurring within the United States in the 21st Century, offering articles that serve as warnings of the fragile state of the religious liberties that many Americans take for granted. Topics include school prayer, the Establishment Clause in the Constitution, the religious right, and argument for and against a religious liberty amendment. Book suggestions, and reviews, are included. Published by Christianity Today Magazine, the site cites laws and potential problems and benefits relating to the church's tax obligations and rights within the U.S. tax code. The weekly magazine offers several articles on various tax subjects relating to the church, as well as immigration status, insurance matters, risk factors, and related topics. The electronic edition provides much of its content, and subscription options to its print version are included. A religious liberty ministry of the Pacific Union Conference of Seventh-day Adventists, the Council provides legal and counseling services to those suffering religious discrimination, monitors legislation in a five-state territory (Arizona, California, Hawaii, Nevada and Utah), and offers educational material and programs on religious freedom issues. Publications, podcasts, and a calendar of events are posted. The University of Notre Dame's program on church, state, and society emphasizes the role that religion plays in society and how these relationships are structured or constrained by the law, and hosts conferences, workshops, and other programs. Contributing faculty and students are acknowledged, a calendar of events is posted, and its research materials and publications are highlighted. A blog is also included. Insisting that the United States was founded as a secular nation, the site offers an overview of the historical record and points readers to primary documents and secondary material that would tend to support this position. Defining the idea that the US was founded as a Christian nation as mythology, the site makes that argument and offers other responses to those who may insist that America was founded by Christians and on Christian principles, which are portrayed as lies. The Christian think tank was created for the purpose of advocating for religious freedom in Australia, including the freedom of religion, freedom of expression, and the freedom to associate. Articles and video on a variety of topics related to the organization's purpose and work are presented, and may be browsed by author, collection, jurisdictions, conferences, submissions, and type of media. General information about the organization, and a newsletter, are included. The Christian political organization is dedicated to the preservation of what it views as the bedrock of Christian principles upon which the United States was founded. Its core beliefs are stated, and a biography of its directory is presented, with quotes and resources from the founders of the United States and others throughout the country's history, issues of interest, and an online store offering books, DVDs and other resources. Although its stated position is one of not being aligned with any specific political party, the work of the Interfaith Alliance has concentrated on countering the influence of the religious right on American politics, championing progressive policies, lobbying congress on behalf of liberal issues, and organizing state and federal initiatives. An overview of the group's organizational structure is presented, along with action items, issues, and membership options. Published by Oxford University Press, the JCS intends to promote interest, research, dialogue, and publication in the area of religion and government, publishing constitutional, historical, philosophical, theological, and sociological studies on the relationship and dynamics of religion and politics in various countries, including the United States. Each issue features five or more major articles and thirty-five to forty book reviews on these topics. Maintained by the Pew Research Center, the mission of the Pew Forum is to promote a deeper understanding of issues that exist at the intersection of religion and public affairs, which it pursues by delivering information to national opinion leaders, including government officials and journalists, without taking a position on policy issues. Its work is focused on the relationships of religion with politics, law, domestic policy, social trends and world affairs, and the media. A project of the John C. Danforth Center on Religion & Politics at Washington University in St. Louis, the online magazine offers news and opinion related to religion and politics, featuring articles from scholars and journalists who write about the ways in which religion and politics converge, clash, and shape public life, whether in the state house, the school systems, the laboratories, homes, and battlefields. Article are arranged by topic, and its content may be searched by keyword. A program of Americans United for Separation of Church and State, the organization is a place for student activists to get involved in the task of maintaining religious freedom, and ensuring that people are not discriminated against by those who believe differently than they do. The youth advisory council and internships are are featured, along with information about youth activist awards and its essay contests. Wallbuilders, a Christian apologetics organization founded by David Barton, offers tips for Christians on how to reply to arguments of separation of church and state. The article discusses the origination of the phrase, and compares today's interpretation of it with what the US constitution actually says, as well as pointing out the role that Christianity has played in the United States throughout history. Citations are offered. Search for Church & State on Google, Bing, or Yahoo!